At Holiday Academy, we have fun and engaging music workshops and activities during which we and the children sing, compose, and play a variety of instruments, including drum, percussion, and ukuleles. We love all kinds of songs, old and new, with body beats, rhythmic clapping songs, good old Beatles singsongs, action songs, and trying out a bit of harmony. As we are a multi-activity camp each child will have a group 40 minute music session as part of the Holiday Academy morning, alongside drama/street dance and sport. Music really is an amazing and really beneficial art form for people of all ages, but especially for kids who are growing, learning, and developing. By being exposed to a variety of different types of music and learning how to play a musical instrument, a child of any age can improve in many areas of his or her life. For example, music can help a child excel in the classroom at a variety of subjects, from maths to science. Music can also help a child become more expressive and confident, whether or not he or she enjoys performing in front of others. Music is a universal language, so even if your child does not speak English well, they will engage and enjoy the sessions. Holiday Academy is different to many holiday camps – it’s a series of sessions/workshops in art, music, drama, dance and sport, all delivered by experts with experience, knowledge and enthusiasm. Our fun children’s workshops make every day special. The children’s music workshop is a part of the daily timetable, and gives your child a brilliant foundation in the fundamentals of sound, rhythm and lyrics. Our children’s music workshop is a place to explore and discover, rather than follow a formal syllabus. We all agree that children might watch and observe for up to a year before perhaps picking up an instrument or really getting into vocal expression. Sometimes we bring in a musical workshop from outside (like the Tub-up all day ukelele workshop, and the Steel Band workshop) if something really catches our eye. We focus on creating fun workshops for kids – with the idea that they’ll learn without realising it. At Holiday Academy day-camp we embrace all kinds of music activities for children. Like babies who are shown picture books before they can recognise the shapes, children can be introduced to the rhythm and melody of music before they learn to understand it. Under this philosophy, listening to music is as valuable as picking up a tambourine. We move on to simple musical games and group work. For the older ones, the music sessions are a chance to learn some current songs or a scene from a musical, create their own music, or do something super cool like ‘flossing’, body beating, and ‘tapping’. Children can make musical sounds using almost anything, including their own bodies – if it’s fun then it goes! We run music activities for children from 3 years upwards, in age groups, as an essential part of Holiday Academy. Our vocal coach, singer/song writer Lisa Panther comes in to provide expert supervision and inspiration for the musical activities, which will often tie in with a drama project. At Holiday Academy we make it a point to offer a variety of musical style in our activities, sessions and music workshops for children from the age of 3 years. These programs are designed to give kids a deeper understanding of music so that they can better enjoy listening to it, dancing to it, and performing songs as part of a group learning and having fun alongside each other. The children learn without realising that they are learning, and every session is planned for the different age groups that participate. For the Summer day camp 2015, we started a Suzuki club! 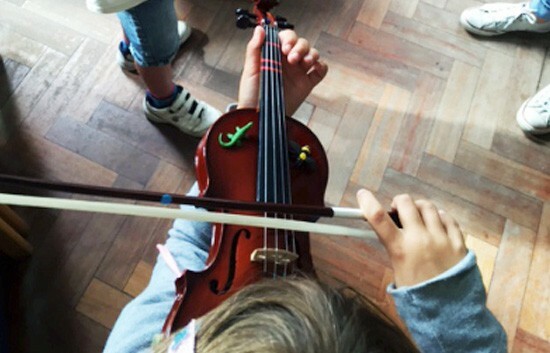 This is an intuitive and play-based way to learn the violin, but the club also includes group sessions with musical games that further enhance learning and promote a true love and understanding of the art of music. Please email to register your interest as they don’t happen every holiday! And if you have no idea what the Suzuki method of teaching music is and want to learn more about it, you can read our blog about the Suzuki method. 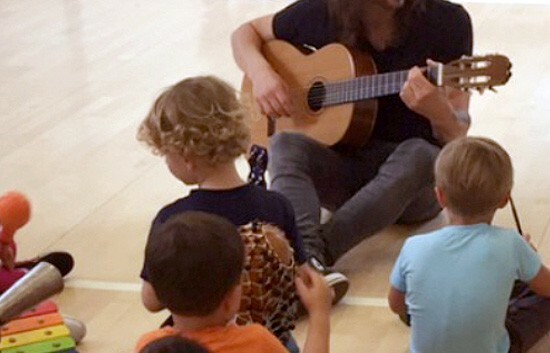 Ultimately, music brings so much joy into children’s lives, so teaching your child about music, from dancing to playing an instrument and more, is a great way to help him or her develop a variety of new social, motor, emotional, and intellectual skills while at the same time learning all about self-expression and creativity.